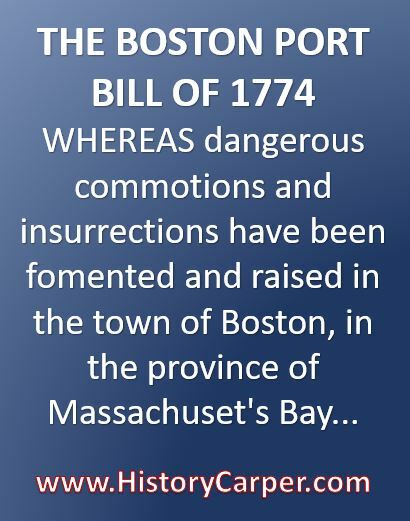 WHEREAS dangerous commotions and insurrections have been fomented and raised in the town of Boston, in the province of Massachuset’s Bay, in New England, by divers ill-affected persons, to the subversion of his Majesty’s government, and to the utter destruction of the publick peace, and good order of the said town; in which commotions and insurrections certain valuable cargoes of teas, being the property of the East India Company, and on board certain vessels lying within the bay or harbour of Boston, were seized and destroyed: And whereas, in the present condition of the said town and harbour, the commerce of his Majesty’s subjects cannot be safely carried on there, nor the customs payable to his Majesty duly collected; and it is therefore expedient that the officers of his Majesty’s customs should be forthwith removed from the said town: May it please your Majesty that it may be enacted; and be it enacted by the King’s most excellent majesty, by and with the advice and consent of the lords spiritual and temporal, and commons, in this present parliament assembled, and by the authority of the same, That from and after the first day of June, one thousand seven hundred and seventy-four, it shall not be lawful for any person or persons whatsoever to lade, put, or cause or procure to be laden or put, off or from any quay, wharf, or other place, within the said town of Boston, or in or upon any part of the bay, commonly called The Harbour of Boston, between a certain headland or point called Nahant Point, on the eastern side of the entrance into the said bay, and a certain other headland or point called Alderton Point, on the western side of the entrance into the said bay, or in or upon any island, creek, landing-place, bank, or other place, within the said bay or headlands, into any ship, vessel, lighter, boat, or bottom, any goods, wares, or merchandise whatsoever, to be transported or carried into any other country, province, or place whatsoever, or into any other part of the said province of the Massachuset’s Bay, in New England; or to take up, discharge, or lay on land, or cause to procure to be taken up, discharged, or laid on land within the said town, or in or upon any of the places aforesaid, out of any boat, lighter, ship, vessel, or bottom, any goods, wares, or merchandise whatsoever, to be brought from any other country, province, or place, or any other part of the said province, of the Massachuset’s Bay, in New England, upon pain of the forfeiture of the said goods, wares, and merchandise, and of the said boat, lighter, ship, vessel, or bottom into which the same shall be put, or out of which the same shall be taken, and of the guns, ammunition, tackle, furniture, and stores, in or belonging to the same: And if any such goods, wares, or merchandise, shall, within the said town, or in any the places aforesaid, be laden or taken in from the shore into any barge, hoy, lighter, wherry, or boat, to be carried on board any ship or vessel outward-bound to any other country or province, or other part of the said province of the Massachuset’s Bay in New England, or to be laden or taken into such barge, hoy, lighter, wherry, or boat, from or out of any ship or vessel coming in and arriving from any other country, such barge, hoy, lighter, wherry, or boat shall be forfeited and lost. II. And be it further enacted by the authority aforesaid, That if any warfinger, or keeper of any wharf, crane, or quay, or their servants, or any of them, shall take up or land, or knowingly suffer to be taken up or landed, or shall ship off, or suffer to be waterborne, at or from any of their said wharfs, cranes, or quays, any such goods wares, or merchandise; in every such case, all and every such wharfinger, and keeper of such wharf, crane, or quay, and every person whatever who shall be assisting, or otherwise concerned in the shipping or in the loading or putting on board any boat, or other vessel, for that purpose, or in the unshipping such goods, wares, and merchandise, or to whose hands the same shall knowingly come after the loading, shipping, or unshipping thereof, shall forfeit and lose treble the value thereof, to be computed at the highest price which such sort of goods, wares, and merchandise, shall bear at the place where such offence shall be committed, at the time when the same shall be so committed, together with the vessels and boats, and all the horses, cattle, and carriages, whatsoever made use of in the shipping, unshipping, landing, removing, carriage, or conveyance of any of the aforesaid goods, wares, and merchandise. III. And be it further enacted by the authority aforesaid, That if any ship or vessel shall be moored or lie at anchor, or be seen hovering within the said bay, described and bounded as aforesaid, or within one league from the said bay so described or the said headlands, or any of the islands lying between or within the same, it shall and may be lawful for any admiral, chief commander, or commissioned officer, of his Majesty’s fleet or ships of war, or for any officer of his Majesty’s customs, to compel such ship or vessel to depart to some other port or harbour, or to such station as the said officer shall appoint and to use such force for that purpose as shall be found necessary: And if such ship or vessel shall not depart accordingly, within six hours after notice for that purpose given by such person as aforesaid, such ship or vessel, together with all the goods laden on board thereon, and all the guns, ammunition, tackle, and furniture, shall be forfeited and lost, whether bulk shall have been broken or not. IV. Provided always, That nothing in this act contained shall extend, or be construed to extend, to any military or other stores of his Majesty’s use, or to the ships or vessels whereon the same shall be laden, which shall be commissioned by, and in the immediate pay of, his Majesty, his heirs or successors; nor to any fuel or victual brought coastwise from any part of the continent of America for the necessary use and sustenance of the inhabitants of the town of Boston, provided the vessels wherein the same are to be carried shall be duly furnished with a cocket and let-pass, after having been duly searched by the proper officers of his Majesty’s customs at Marblehead, in the port of Salem, in the said province of Massachuset’s Bay; and that some officer of his Majesty’s customs be also there put on board the same vessel, who is hereby authorized to go on board, and proceed with the said vessel, together with a sufficient number of persons properly armed, for his defence to the said harbour of Boston; nor in any ships; nor to any ships or vessels which may happen to be within the said harbour of Boston on or before the first day of June one thousand seven hundred and seventy four and may have either laden or taken on board, or be there with intent to load or take on board, or to land or discharge any goods, wares, and merchandise provided the said ships and vessels do depart the said harbour within fourteen days after the said first day of June one thousand seven hundred and seventy-four. V. And be it further enacted by the authority aforesaid, That all seizures, penalties, and forfeitures, inflicted by this act, shall be made and prosecuted by any admiral, chief commander, or commissioned officer, of his Majesty’s fleet, or ships of war, or by the officers of his Majesty’s customs, or some of them, or by some other person deputed or authorised, by warrant from the lord high treasurer, or the commissioners of his Majesty’s treasury for the time being, and by no other person whatsoever: And if any such officer, or other person authorised as aforesaid, shall, directly or indirectly, take or receive any bribe or reward, to connive at such lading or unlading, or shall make or commence any collusive seizure, information, or agreement for that purpose, or shall do any other act whatsoever, whereby the goods, wares, or merchandise, prohibited as aforesaid, shall be suffered to pass either inwards or outwards, or whereby the forfeitures and penalties inflicted by this act may be evaded, every such offender shall forfeit the sum of five hundred pounds for every such offence, and shall become incapable of any office or employment, civil or military; and every person who shall give, offer, or promise, any such bribe or reward, or shall contract, agree, or treat with any person, so authorised as aforesaid, to commit any such offence, shall forfeit the sum of fifty pounds. VII. And be it further enacted by the authority aforesaid, That every charter party bill of loading, and other contract for consigning shipping, or carrying any goods, wares, and merchandize whatsoever, to or from the said town of Boston, or any part of the bay or harbour thereof, described as aforesaid, which have been made or entered into, or which shall be made or entered into, so long as this act shall remain in full force, relating to any ship which shall arrive at the said town or harbour, after the first day of June, one thousand seven hundred and seventy-four, shall be, and the same are hereby declared to be, utterly void, to all intents and purposes whatsoever. VIII. And be it further enacted by the authority aforesaid, That whenever it shall be made to appear to his Majesty, in his privy council, that peace and obedience to the laws shall be so far restored in the said town of Boston, that the trade of Great Britain may safely be carried on there, and his Majesty’s customs duly collected, and his Majesty, in his privy council, shall adjudge the same to be true, it shall and may be lawful for his Majesty, by proclamation, or order of council, to assign and appoint the extent, bounds, and limits, of the port or harbour, of Boston, and of every creek or haven within the same, or in the islands within the precincts thereof; and also to assign and appoint such and so many open places, quays, and wharfs, within the said harbour, creeks, havens, and islands, for the landing, discharging, lading, and shipping of goods, as his Majesty, his heirs or successors, shall judge necessary and expedient; and also to appoint such and so many officers of the customs therein as his Majesty shall think fit; after which it shall be lawful for any person or persons to lade or put off from, or to discharge and land upon, such wharfs, quays, and places, so appointed within the said harbour, and none other, any goods, wares, and merchandise whatever. IX. Provided always, That if any goods, wares, or merchchandize, shall be laden or put off from, or discharged or landed upon any other place than the quays, wharfs, or places, so to be appointed, the same, together with the ships, boats, and other vessels employed therein, and the horses, or other cattle and carriages used to convey the same, and the person or persons concerned or assisting therein, or to whose hands the same shall knowingly come, shall suffer all the forfeitures and penalties imposed by this or any other act on the illegal shipping or landing of goods. X. Provided also, and it is hereby declared and enacted, That nothing herein contained shall extend, or be construed, to enable his Majesty to appoint such port, harbour, creeks, quays, wharfs, places, or officers, in the said town of Boston, or in the said bay or islands, until it shall sufficiently appear to his Majesty that full satisfaction hath been made by or on behalf of the inhabitants of the said town of Boston to the united company of merchants of England trading to the East Indies, for the damage sustained by the said company by the destruction of their goods sent to the said town of Boston, on board certain ships or vessels as aforesaid; and until it shall be certified to his Majesty, in council, by the governor, or lieutenant governor, of the said province, that reasonable satisfaction hath been made to the officers of his Majesty’s revenue, and others, who suffered by the riots and insurrections above mentioned, in the months of November and December, in the year one thousand seven hundred and seventy-three, and in the month of January, in the year one thousand seven hundred and seventy-four. XI. And be it further enacted by the authority aforesaid, That if any action of suit shall be commenced, either in Great Britain or America, against any person or persons, for any thing done in pursuance of this act of parliament, the defendant or defendants in such action or suit, may plead the general issue, and give the said act, and the special matter, in evidence, at any trial to be had thereupon, and that the same was done in pursuance and by the authority of this act: and if it shall appear so to have been done, the jury shall find for the defendant or defendants; and if the plaintiff shall be nonsuited, or discontinue his action, after the defendant or defendants shall have appeared: or if judgment shall be given upon any verdict or demurrer, against the plaintiff, the defendant or defendants shall recover treble costs, and have the like remedy for the same, as defendants have in other cases by law.